Here are some facts about the Great Exhibition – an exhibition which took place in Hyde Park to celebrate ‘the works of industry of all nations’. 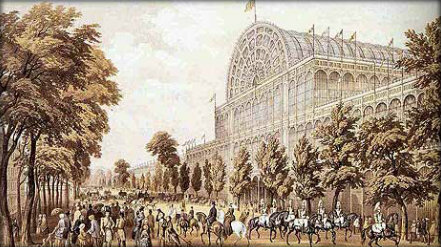 The Great Exhibition was opened on 1st May 1851 and it came to end on 15th October 1851. It was held in Hyde Park in a massive purpose-built glass structure called ‘The Crystal Palace’. 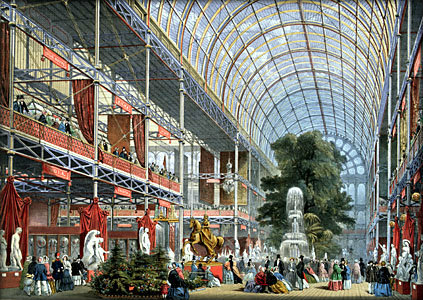 Prince Albert, the husband of Queen Victoria, organised The Great Exhibition (with the help of Henry Cole – the inventor of the Christmas card). The main aim of The Great Exhibition was for Great Britain to show off, demonstrating its inventiveness and modern industrial designs and ideas to the rest of the world. The Crystal Palace measured 564 metres by 138 metres and was constructed from thousands panes of glass. After the exhibition, it was moved from Hyde Park to Sydenham in south London, where it was extended. This area of London is now known as Crystal Palace. Unfortunately, The Crystal Palace was destroyed by fire in 1936. Over 6 million people visited the Great Exhibition. It was a massive success and the money it raised was used to set up the Natural History Museum, the Science Museum and the Victoria and Albert Museum in London. Many famous Victorians attended, including: Charles Darwin, Samuel Colt, Charles Dickens, Emily Bronte, George Eliot and Lewis Caroll. Over 100,000 objects were on display in The Crystal Palace – half of these were from Britain. Some of the exhibits included: a massive hydraulic press (designed by Stevenson), a steam hammer, counting machines, carpets, ribbons, printing machines, musical instruments, carriages, early versions of bicycles, agricultural machines, guns and watches. The famous Koh-i-Noor diamond was on display at the Great Exhibition. In the centre of the glass building stood a fountain constructed from pink glass. This was 27 feet high. The Crystal Palace featured the first public toilet cubicles. The inventor of these, George Jennings, charged a penny. This is where the expression ‘spend a penny’ comes from. cool i got some good facts off this. We love Christmas and this website!! Thanks for using Primary Facts. Glad you found the information useful. I totally agree with you because this is AMAZING!! Glad we were able to help you out, Eve. Thanks for using Primary Facts. I really used this for my poster I was gonna show and tell at school so everyone knows some facts and,but it was so…COOL pictures though.